One day we spent extra time visiting with people on the street instead of our usual schedule at Holy Cross on 42nd Street. At the end of our route, Ed told us there was one more person we could visit with who has met LAMP missionaries over the years. He introduced us to Dylan*, a homeless veteran with one prosthetic leg, a cowboy hat, shoulder-length red hair, and a new “USMC” tattoo on his neck. Dylan told us how he sleeps on the streets and how people search through his pockets and try to take advantage of him, partly because of his leg. He showed us a pocketknife that he keeps in his hand and told us that he sleeps upright in his chair, half on-guard against people trying to rob him. Eventually, Brooke asked him if he has a favorite Bible verse; he responded, “Yes, John 3:16 – ‘God so loved the world that he sent his only begotten Son…'” I was reminded of one of my favorite verses, so I told him and asked if I could share it with him. A light sparked in his dark eyes, his face softened, and his hard street exterior began to crumble. We then asked if he would like for us to pray with him; he stuck out his hand and we each placed a hand on his fist and prayed with and for him. After closing our prayer, we asked him to pray for us, meaning to keep us in his future prayers. Yet once more Dylan stuck out his fist and we touched his hand as he led a simple prayer from the heart to Jesus, asking for many blessings for us, his “sisters”, and those we would serve that day. After, he sang us a song he made and encouraged us “kids” to keep up the good work. The Lord showed me that day His Word in flesh. He let the three of us live John 10:10. His Heart beat through each of us as our hearts spoke to one another. 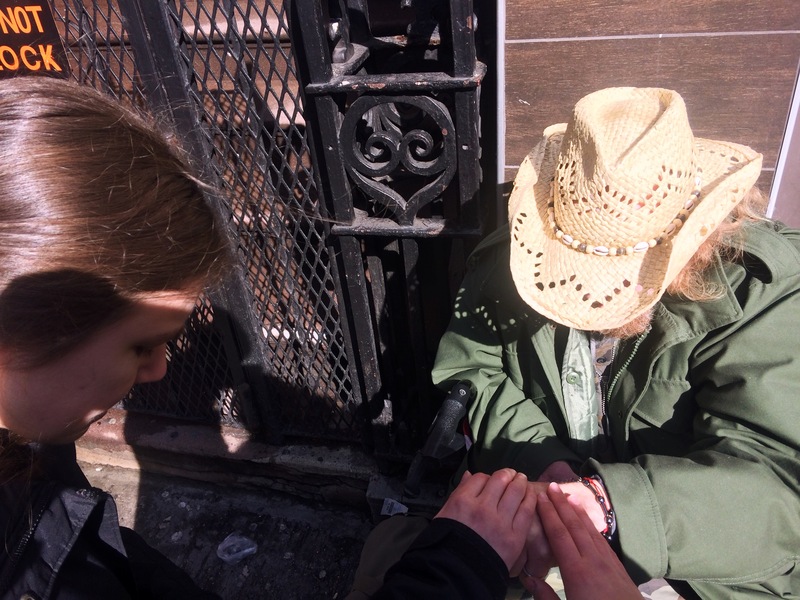 I’m continually surprised by the many ways Jesus disguises and reveals Himself through the poor here in NYC.